An award-winning PR agency with national clients across consumer and trade sectors, Whistle PR is located in the heart of the prestigious Fort Dunlop building in Birmingham. This huge concrete structure, completed in the 1920s, was once the world’s largest factory, employing 10,000 people in its heyday as the original tyre factory and main office of Dunlop Rubber. The factory closed in the 1980s and the site lay derelict for many years before developers Urban Splash began an ambitious project to convert the building into a landmark mixed use development. Today, Fort Dunlop is a place to work, relax and shop; home to a Travelodge, retailers, coffee shops and more than 40 businesses of all sizes, including Whistle PR. With a team of 20, Whistle PR’s office within the main building includes open plan office space, partitioned offices, a kitchen with breakout area and a boardroom used for client meetings and internal events. Like many offices, this bespoke layout proved a challenge because the existing zoning of the building’s main HVAC system did not accommodate for retrospective partitioning of the overall space, leaving the company boardroom without sufficient heating. The issue was made worse by the huge windows which span from the floor to the 3.5m ceilings, a feature of the expansive Fort Dunlop. 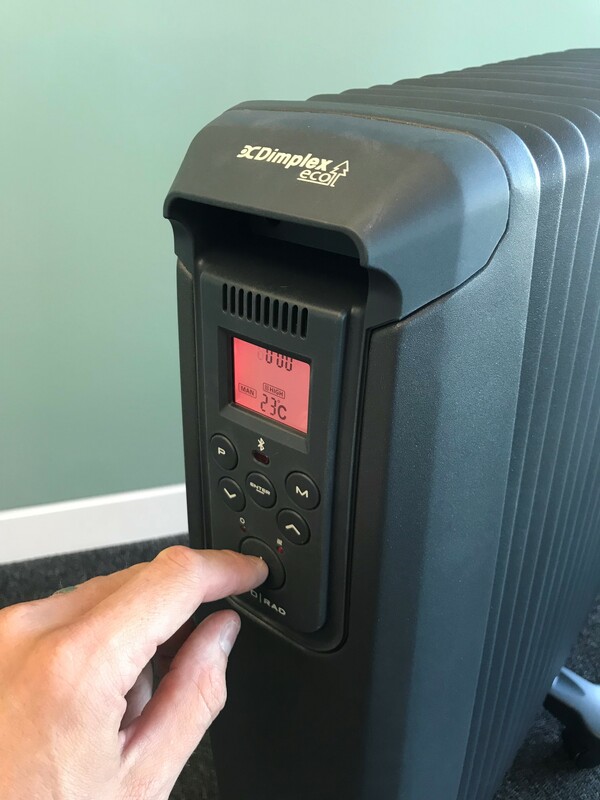 The solution came in the form of a Dimplex EvoRad Bluetooth Controlled 2kW oil free eco radiator in anthracite; a stylish, portable radiator with enhanced control features. 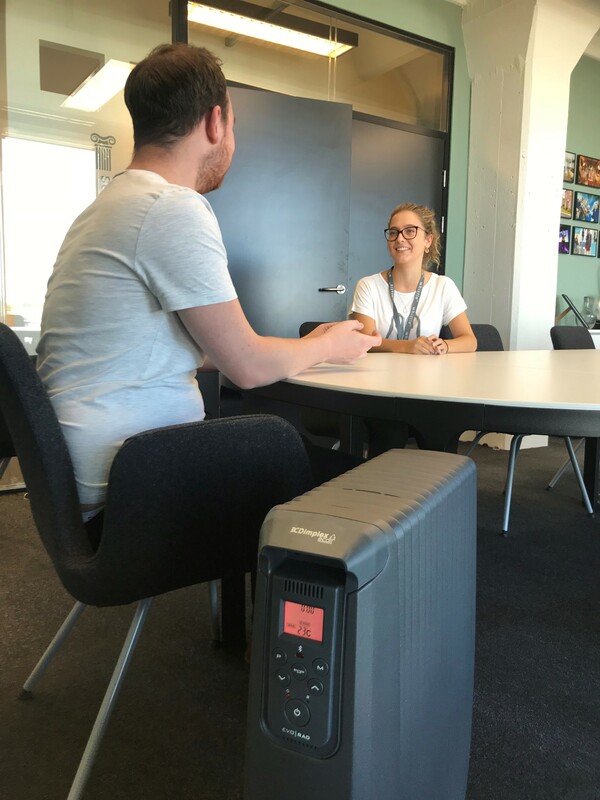 Whistle PR use the EvoRad to add supplementary heating in the boardroom, taking advantage of its ultra-rapid heat up to add comfort in meetings through the colder months. The patented oil-free technology ensures quick heat up and an eco-friendly alternative to oil-filled models, saving up to 18% energy when heating a room compared to a traditional oil-filled column radiator. It also offers an LCD screen with Eco heat setting which ‘learns’ our usage patterns and optimises energy use. Easily portable with castors and integrated carry handles, the EvoRad ensures no risks of leaks or ruptures and is BEAB approved for added peace of mind. For Sarah Kent, however, it was the stylish design and impressive controls that made sure the EvoRad was the perfect choice for Whistle PR. She said: “As a creative business it was important for us to find a heating solution that would not look out of place in a modern office – and the anthracite design was the stylish feature we were looking for. “But more than that, it is so easy to operate. There is a simple control panel, or we can even operate it via a smart phone, which is particularly handy if we forget to turn it off.